Intel (NASDAQ: INTC) has cut its full-year profit outlook, the latest indication that Windows 8, Ultrabooks and other innovations won't fully lift the PC industry out of an economic funk. Still, Intel channel partners have at least four reasons to be upbeat. Intel (NASDAQ: INTC) has cut its full-year profit outlook, the latest indication that Windows 8, Ultrabooks and other innovations won’t fully lift the PC industry out of an economic funk. Still, Intel channel partners have at least four reasons to be upbeat. Specifically: Intel data center sales remain strong, current Ultrabook sales are meeting forecasts, Windows 8 tablets are nearing launch and McAfee security software revenues apparently grew in Q2, 2012. Intel’s earnings arrive during a challenging time for the PC industry. Gartner says Q2 PC sales were flat, AMD issued a profit warning, and Apple’s iPad continues to attract consumer dollars. The result: Intel’s Q2 earnings fell 4.3 percent, and the company said macroeconomic conditions will pressure future earnings. Smartphones with Intel processors launched in China, France and India during the quarter. $699 Ultrabooks will arrive this fall, and current Ultrabook sales are meeting expectations. 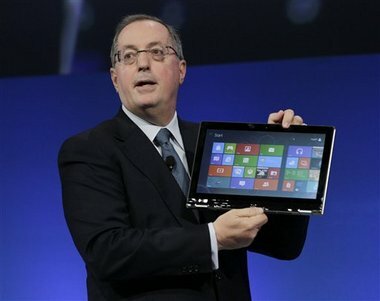 More than 20 Windows 8 Tablets with Intel’s Clover Trail Atom SoC and core-based tablets will arrive this fall. Data center revenues grew 15 percent in the quarter. Software and services group revenue, including McAfee security software, reached $586 million in the quarter, up from $511 million in the same quarter last year. IBM (NYSE: IBM) and Microsoft (NASDAQ: MSFT) are set to announce earnings this week, with VMware (NYSE: VMW) results coming next week. VMware apparently changed CEOs ahead of next week’s earnings call, suggesting that even the hottest IT markets face macroeconomic and competitive pressures.